non-soluble tantalum salt can not be absorbed through mouth or Percutaneous injection, gastrointestinal tract also has tiny absorptive amount for soluble tantalum salt. After Tantalum enter the body,phagocyte, the main carrier responsible for clear up the tantalum, still alive and have no cellular degeneration condition 1 hour after contacted with tantalum. While, in the same condition, silica dusts will make the phagocyte have strong cytoplasm degeneration and death, which means tantalum has no cytotoxic. Pure tantalum has been applied in the orthopedics medical treatment. Because tantalum has good ductility, it has made to thin wire like hair. 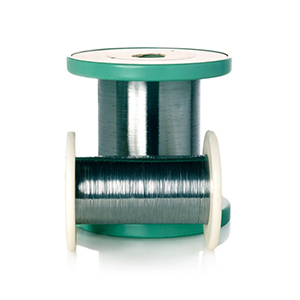 Tantalum wire can be used as surgical suture has the advantages of easy sterilization, small stimulus, strong tension stress, at the same time it has disadvantage of difficult to tie a knot. Tantalum can be used to to sew bone, tendon, fascia, and retention suture and teeth ligation. It could also used as surgical suture in internal organs operation or implanted into the artificial eye. It can even be used to replace tendon and nerve fiber. Tantalum can be made to tantalum sheets in different shapes and sizes to repair broken skull and fractures by implanting it to different positions in human body. When we fix the artificial ear made by tantalum on the head and transplant the skin from leg, the artificial ear looks naturally after a period. Using tantalum wire to sew netty balloon dilatation holder makes the holder clearly under the X Ray and easy for monitoring and following up. Tantalum holder has no breakage and erosion for the human body even putting into the human body for long time. Because Tantalum has good decay resistance, people coat it on some medical metal surface to prevent the releasing of toxic element and improve metal material’s biocompatibility. At the same tantalum coating can also improve visuality of metal material in human body. Using multi-arc ion coating to make tantalum coating on the Ni-Ti shape memory alloy surface, compared with non-coating Ni-ti alloy, tantalum coated material has longer clotting time, no obvious soterocyte accumulation, only a few pseudopodium appeared, It showed the biocompatibility of Ni-ti alloy has been improved with tantalum coating. At the same time, as tantalum has X ray visuality, there is no need to mark on the holder. Tantalum coating can improve skeleton integration performance of Titanium, improve cell adhering capacity and helps cell grow. Higher surface and better wettablity help cell to interact with embedded material. Besides metal material, tantalum can also coated into some non-metallic material, for example, carbon cage, adding tantalum coating on carbon surface used in spine fusion operation can better serve the operation by improving the strength and tenacity of carbon cage. Tantalum can also combine with some polymer to be composite material. It can improve the visuality and biocompatibility of composite material by coating on the surface. Porous tantalum can be used as filling material for our human body, for example the tissue restricting after removal of tumor, neck and vertebra lumbalis dissolution filling and spine replacement. Because of its perfect combination of mechanical property, tissue growth anf manufacturing property, it has broad design space for its formulation.